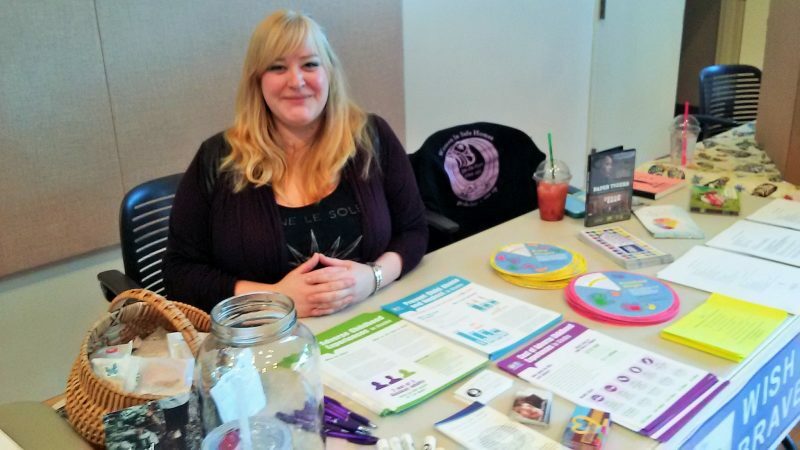 Half of all Alaska women are survivors of domestic violence or sexual assault. That’s according to a 2015 study by the University of Alaska Anchorage’s Justice Center. But options are limited for victims in small towns where there’s no shelter. Jessica Whitaker works in a behavioral health clinic in Wrangell. When she sees patients with signs of domestic abuse, she relies on a discreet network to help. “I don’t even know who the homes are we just know who to call,” she said. Those calls go to anonymous volunteers willing to house people fleeing abusive partners. “But again I don’t think they like to freely advertise it because then people will just come knocking on the door and say ‘Can I stay here?’ and that’s not what they want either,” she said. It’s hard to track incidents in a town like Wrangell. You can check the courts. Seventeen people petitioned for a domestic violence protective order so far this year. But advocates like Kay Larson say that’s only a fraction. “One of the things that I notice, just as a citizen, is opening up the weekly paper and looking at the police report and seeing a lot of calls related to domestic violence or situations like that,” she said. Larson is the founder of BRAVE. It stands for Building Respecting and Valuing Everyone. It’s a Wrangell coalition committed to combating the problem. Larger communities in Southeast Alaska have emergency shelters. Juneau, Ketchikan and Sitka have them. But not Wrangell. “It is hard when your own community doesn’t have a safe place, that’s my biggest fear here,” said Eryn Ruppert, a Ketchikan-based advocate for WISH. It’s another acronym. It stands for Women in Safe Homes in Ketchikan. The organization plans to regularly send one of its staffers to Wrangell. But with often no place for victims to go, Ruppert says counseling alone isn’t enough. “Where are these people going to go? Where am I going to refer them when I come in here,” she said. In extreme cases, WISH can help relocate survivors to its Ketchikan shelter. But not everyone can move. Ruppert said the first step is offering a safe place in Wrangell where people can meet. “For people to come and talk just about what they are going through and their potential paths for their future to stay safe,” she said. The case worker will try to find new local housing and, in instances where physical violence is likely, somewhere they can go in a hurry. “Safety planning is for people who sense themselves getting into a dangerous situation or for people who are always at home always on edge waiting for the shoe to drop so to speak,” Ruppert said. There is goodwill in Wrangell. Churches or sympathetic families pitch in, offering a hot meal, a warm bed or even a ferry or plane ticket out. But advocates like Ruppert argue that this has its shortcomings. “New people in the community that don’t know that there’s this underground help system, and they have nowhere to turn to. They have zero resources,” she said. The monthly visit by WISH advocates is the first step towards changing that. The first visit is slated for Oct. 9. At a location to be determined.